The second annual New England Financial Marketing Awards Gala produced by Agility Resources Group, was held last Wednesday, September 26, at the Sheraton Hotel and Conference Center in Framingham, Massachusetts. The NEFMA Awards are presented to community banks and credit unions located throughout New England. They are broken up into six categories including, brand, loan, deposit, service, public relations and internal marketing. The NEFMAs salute the marketing campaigns, community projects and innovative people who have raised the bar on bank and credit union marketing and have achieved outstanding results. The awards gala also included the Community Champion Awards that honor community banks and credit unions that took extraordinary measures to service their communities. The Community Champion Awards are also divided into six different categories including, economic development, civic involvement, financial education, arts, overall philanthropy, and inspiration. From a field of fifty award-winners, Essex Savings Bank received five awards in the category of the Community Champion Awards 2013. They are: *Gold Award – Economic Development; *Gold Award – Civic Involvement; *Gold Award – Overall Philanthropy (Awarded for the Bank’s Community Investment Program which was established to distribute 10% of the Bank’s net profits to 501(c)3s on an annual basis; *Silver Award – Branding; *Silver Award – Arts, awarded for the contributions of both Bank funds and employee volunteers to the local cultural arts. Essex Savings Bank is a FDIC insured, state chartered, mutual savings bank established in 1851. The Bank serves the Connecticut River Valley and shoreline with six offices in Essex (2), Chester, Madison, Old Lyme and Old Saybrook. Financial, estate, insurance and retirement planning are offered throughout the state by the Bank’s Trust Department and wholly-owned subsidiary, Essex Financial Services, Inc., Member FINRA, SIPC. Investments in stocks, bonds, mutual funds and annuities are not FDIC insured, may lose value and are not a deposit, have no Bank guarantee and are not insured by any Federal Government Agency. 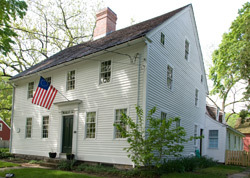 ESSEX — The Essex Historical Society (EHS) has been awarded a $12,500 grant from the 1772 Foundation, in partnership with CT Trust for Historic Preservation, to support restoration work on the Pratt House Museum. The award is part of the 1772 Foundation’s highly competitive matching grant program for historic preservation projects. The funding will support repair on the Pratt House that was recommended by Building Conservation Associates, Inc. of Dedham, Mass., in its 2012 Architectural Conservation Assessment. These recommendations include: repair of the Pratt House’s exterior foundation, painting the exterior and glazing its windows, repairing gutter work, cleaning the interior of the chimney and replacing a missing door in the cellar. The restoration work is scheduled to begin October 2014 and to be complete by May 2015. The historic Pratt House was built in 1701 and was home to the descendants of Lt. William Pratt, one of the three first settlers of Essex for two centuries. Its barn, traditional herb garden and meadow complete the pastoral setting of a New England farmhouse. The house remained in the Pratt family ownership until 1952, when it was deeded to the Society for the Preservation of New England Antiquities (now known as Historic New England). In 1985 Historic New England transferred the property and much of its contents to EHS, and EHS has been caring for the property ever since. Visitors are invited to tour the home Fridays through Sundays, from June through September. About the 1772 Foundation —The 1772 Foundation was named in honor of its first restoration project, Liberty Hall in Union, NJ, which was built in 1772 and is the ancestral home of the Livingston and Kean families. The late Stewart B. Kean was the original benefactor of the 1772 Foundation. The Foundation seeks to continue his legacy throughout the country by helping preserve architectural and cultural history and agricultural landscapes for generations to come. For more information, visithttp://www.1772foundation.org/. About the Essex Historical Society — The Essex Historical Society seeks to promote awareness and understanding of the people, places and events that have shaped the history of Essex, Connecticut. The Society collects and interprets artifacts and archival material, and provides educational programs and exhibits to bring those interpretations to the community. To house this collection and to provide a window into earlier Essex life, the Society maintains two historic structures: Pratt House (1701) and Hills Academy (1832). Recognizing the importance of the past to our understanding of the present and our planning for the future, the Essex Historical Society advocates the preservation of significant structures and sites that reveal the history of Essex. To learn more, visit the EHS website and follow EHS on Facebook. Boy Scouts of America would like to congratulate Benjamin Dale Swartzell for earning the rank of Eagle Scout. 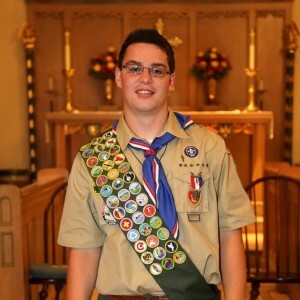 An Eagle Scout Court of Honor was held for Ben on September 21, 2014 at Saint John’s Episcopal Church in Essex, CT.
To become an Eagle Scout, Ben earned 40 merit badges and advanced through the seven scout ranks by learning Scout and Life skills while simultaneously providing leadership to his Troop and service to his community. One of the final requirements for the Eagle Rank is to show leadership in and complete a service project that benefits the boy’s community, school, or religious institution. Ben’s project was to replace the boardwalk through the historic Cedar Swamp at Bushy Hill Nature Center in Ivoryton. The old walkway had deteriorated over time and was posing a safety risk for campers. The walkway allows campers to walk through the swamp to view ecological diversity at the camp. This project included building a new boardwalk, removing the old walkway and getting the site ready to install the new portion. Ben used leadership skills he learned by attending Boy Scouts National Youth Leadership Training and as a staff member of the CT Rivers Council National Youth Leadership Training program. Change is good when you complete four or more years of college at a prestigious Connecticut College and you have to move out of state to find a job. Change is good when you drive down any street in any town and all you see is a line of Real Estate signs advertising homes for sale because of lost jobs or property taxes being too high. Change is good when you arrive at work only to find that your employer is closing down and moving out of state because they can no longer afford to do business in Connecticut. done and we need to change that. I’ve been a registered Democrat for forty seven years and last year I switched and am now a Republican. Change is good. It is an honor and privilege for me to wholeheartedly endorse the re-election of our 33rd State Senator Art Linares. During his two year tenure as State Senator, Art has worked tirelessly to serve you, his constituents. He has been visible, available and listens to all, regardless of party affiliation. Art Linares has taken the “high road” in this campaign. Instead of criticizing his opponents, he has emphasized his many accomplishments as your State Senator. As a business owner, growing jobs and improving the economy has been a priority. Whether it’s supporting legislation that allows manufacturers to hire apprentices or fighting for a tax structure that will help businesses and working families, Art Linares has been there for us. He has held town meetings throughout the 12 towns in the district welcoming your input and ideas. Art truly cares about you and improving the State of Connecticut. Art Linares is a breath of fresh air. As the old adage goes, “If it ain’t broke, don’t fix it”. On Tuesday, November 4th, re-elect a caring, pro-active public servant. Thank you Senator Linares for your compassion, devotion and commitment to all of us. Following a strong performance Tuesday evening during a public debate at the Valley Regional High School in Deep River, Democratic State Senate Candidate Emily Bjornberg criticized her Republican opponent, Art Linares of Westbrook, for refusing multiple invitations for further debates from non-partisan organizations across the 33rd Senate District. Linares has not accepted a single invitation in one the district’s northern towns, including any and all proposed events north of the Town of Deep River. The 33rd State Senate District includes twelve towns: Chester, Clinton, Colchester, Deep River, East Haddam, East Hampton, Essex, Haddam, Lyme, Old Saybrook, Portland and Westbrook. “I believe in a full and open debate of the issues in this election. It takes over an hour to drive across the 33rd Senate District, one of the largest in the state. Each community has their own unique needs and concerns. For my opponent to agree to debates only in the southern portion of the district is a disservice and an insult to those northern communities,” said Bjornberg. Of the four events the Linares’ campaign has agreed to, two have already occurred, one of which was not located within the 33rd District itself (The Day’s debate was actually held in Old Lyme). Only one of the two events that remain will be open to the public, with approximately six weeks remaining before the general election. The Essex Rotary event is open to club members only. “Art Linares may wish to limit public debate in this election, but the voters deserve a broader discussion. I have challenged my opponent to twelve debates in twelve towns, and I renew that challenge today. If my opponent is proud of his voting record and his positions on the issues, he has no reason to hide,” said Bjornberg. The 33rd District includes the communities of: Chester, Clinton, Colchester, Deep River, East Haddam, East Hampton, Essex, Haddam, Lyme, Old Saybrook, Portland and Westbrook. DEEP RIVER— The three candidates in the 12-town 33rd State Senate District, one-term incumbent Republican Sen. Art Linares, Democratic challenger Emily Bjornberg, and Green Party candidate Colin Bennett, held a lively debate Tuesday that covered the economy and taxes, along with social issues such as reproductive rights and possible right-to-die legislation. A crowd of more than 100 voters filled the auditorium at Valley Regional High School, with sign waving supporters of the two major party candidates gathering outside the school before the start of the debate. The 90-minute session was moderated by Essex Library Director Richard Conroy, who posed questions that had been submitted in writing before the debate from district voters. Linares, describing his record as “pro-growth and pro jobs,” attempted to tie Bjornberg to tax increases imposed during the administration of Democratic Gov. Dannel Malloy and the Democrat-controlled legislature. Bjornberg noted that she was not in the legislature when most of the higher taxes were approved, and pledged to be “very wary” of increases in “regressive taxes,” such as the sales and gasoline taxes, in any future budget decisions. Objections from Linares to the Malloy Administration First Five program of grants and loans for business expansion prompted one of the sharpest exchanges of the session, with Bjornberg noting that Linares had accepted a $350,000 state low interest loan for his Middletown-based Green Skies solar power company while later voting against funding for the program. She also contended Green Skies resells cheaper solar panels from China at the expense of producers in Connecticut and the United States. Linares replied that Bjornberg’s comments show “my opponent is ready to attack a good thing,” describing the business he co-founded as a clean energy company that is providing jobs. The candidates differed on possible right-to-die legislation for the terminally ill, with Bjornberg pledging support for what she called the “compassionate choices” bill that failed to win approval in this year’s legislative session. Linares said he is “concerned about human error,” under the proposed legislation. Bennett also expressed support for the bill that is expected to be considered again next year. A question on reproductive rights and insurance coverage for birth control brought passionate remarks from Bjornberg, declaring that she is concerned about her young daughter losing rights that women have fought for and secured over the past 40 years. Linares said he was “born a Catholic” and is “not running for the U.S. Supreme Court,” before changing the topic to his support for new legislation to protect women from domestic violence. Marijuana and the minimum wage brought the most passionate remarks from Bennett, who has run as the Green Party candidate in three previous elections in the 33rd District. Bennett said “ending the prohibition” on marijuana would help the state’s economy and finances. Linares dismissed the idea of legalizing marijuana, while Bjornberg said she would not support legalization at the present time but favors a “careful and measured” review of the option and possible further reductions in penalties for possession of marijuana. In her closing remarks, Bjornberg called on Linares to agree to hold another campaign debate in one of the northern towns of the sprawling district. Other sessions set for early October are more limited forums that include candidates for state House seats. The 33rd District includes the towns of Chester, Clinton, Colchester, Deep River, East Haddam, East Hampton, Essex, Haddam, Lyme, Portland, Westbrook, and sections of Old Saybrook. In general, Essex is not one of those communities where trash in public places is a problem. Along the length of our Connecticut River shoreline, however, it is another matter. The amount of debris that accumulates along our shores is nothing short of amazing. Unfortunately, there seems to be a never-ending supply of debris along the riverbanks. The Connecticut River’s steady flow towards its mouth brings with it logs, branches and other organic material that are swept into the river by storms, high tides and occasional flooding. It also brings with it an incredible array of items that have clearly been carelessly allowed to be swept away or dumped outright into the river. For the past two years the Essex Land Trust has tried to do its part by focusing on cleaning up Essex’s Great Meadow. This past Fall, on a bright and sunny Saturday morning, 65 volunteers dedicated three hours to gathering all kinds of trash including, significant quantities of Styrofoam, bottles, cans, car tires and more. 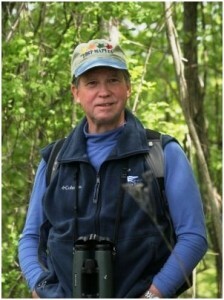 This effort is part of an annual program sponsored by the Connecticut River Watershed Council Participating. Called the Source to Sea Cleanup, each September communities along the 410-mile length of the Connecticut River dedicate themselves to cleaning up their shoreline. This past year, 2,227 volunteers collected a total haul of 45 tons, which included electrical appliances, furniture, automotive parts, and mattresses, among many other items. Besides being unsightly, trash in our water bodies has a damaging effect on the environment particularly impacting wildlife and vegetation. One measure of this impact is the decomposition rate of common debris. 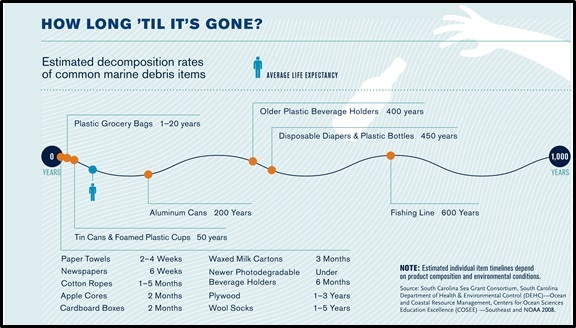 The following chart illustrate how long items last in our environment, i.e., 200 years for aluminum cans and 450 years for plastic bottles. The Connecticut River has come a long way from the 1950s when it was called the “best landscaped sewer in the country.” The passage of the Clean Water Act and the ban on DDT in 1972 have done much to help the river recover to a Class B status, meaning that it is safe for all purposes excluding drinking. 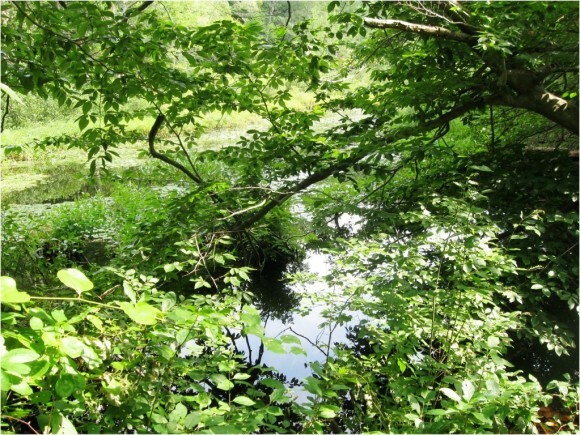 Turning to the future, our challenge is to build on the progress achieved by ensuring a cleaner and healthier river, one that would harken back to the days when the Algonquians gave it its name, the “quinetucket,” the place of the long tidal river. The Land Trust intends to repeat the Great Meadow clean up this coming September. The date has already been set: Saturday, September 27 at 9 am. So, mark your calendars! What with much of the country riveted by the PBS documentary on the “Roosevelt’s,” Essex resident Jerome Wilson has released a photograph of his one time meeting with Eleanor Roosevelt. 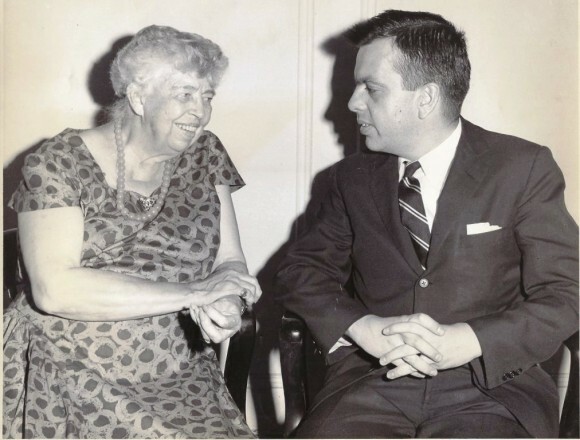 The photograph was taken in the fall of 1962, and it pictured Mrs. Roosevelt’s endorsement of Wilson’s candidacy for the New York State Senate in Albany. Wilson won his race in 1962 and went on to serve three terms in the New York State Senate. Wilson was a member of what was called the Reform Movement in New York City in the 1960’s. 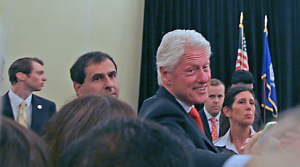 The leaders of the Reform Democratic movement were three notable national Democrats: Eleanor Roosevelt, former New York State Governor Herbert Lehman and former Secretary of the U.S. Air Force, Thomas Finletter. The purpose of this group was to defeat Tammany Hall, Democratic Party officeholders (the so-called “bosses”), and replace them with Reform Democrats. On the West Side of Manhattan, the Reform Democrats had already beaten Tammany Hall candidates in the 1960 elections, electing a U.S. Congressman and a New York State Senator. Wilson’s election as a State Senator on the Manhattan East Side in 1962 would be yet another victory for the Reform Democrats. In addition to electing public officials, the Reform Democrats had set up Reform Democratic clubs on both on the West Side and the East Side of Manhattan. At the time of his election to the New York State Senate, Wilson was the President of the Yorkville Democratic Club, a Reform Democratic club located on East 79th Street in Manhattan. Wilson’s most significant accomplishment during his service in the New York State legislature was to lead the fight to reform the state’s 179-year-old divorce law. New York’s divorce law up until 1966 had only one ground for divorce, which was for adultery. There was not even a ground for extreme physical cruelty. Through his efforts, as Chairman of the Joint Legislative Committee and Family Law, Wilson exposed the inadequacy of the one-ground divorce law, and, as a result, the New York State legislature adopted new grounds for physical and mental cruelty, among other humane grounds for divorce. Every now and then a candidate who represents the best goals of all parties appears. Fortunately we have this candidate in Emily Bjornberg who is running for the 33rd State Senate District. She is energetic, smart, can negotiate, and is a great communicator. Unlike some who run, her desire in doing so is just to make Connecticut a better place. Emily has the skills to do that. A member of the Reynolds Garage family in Lyme, she is a working mother of two children. Her husband, Jason, is an Iraq War Veteran. Among other issues, Emily is strong on the environment, education, woman’s issues, gun control, and improving benefits for veterans. Please take the opportunity to hear Emily speak at a candidate’s forum or “meet and greet” session. You will be sold on her ability to get things done in a thoughtful and positive manner. Please join me on November 4 in supporting Emily Bjornberg for State Senate. I believe her to be the best qualified candidate. ESSEX — The Essex Wellness Center has opened its doors at 28 Main Street in the colonial village of Essex, Connecticut. The first of its kind in or near this idyllic riverfront community, Essex Wellness Center offers a strategically developed range of holistic services in one location. Medical specialties and complementary therapies include naturopathic and Chinese medicine, acupuncture, anti-aging techniques, nutrition for health and weight loss, hypnosis, life coaching, therapy for body image and eating disorders, massage, integrative nurse coaching, mindful meditation, life and business/executive leadership coaching, and counseling for substance abuse and addictions. Having a team of holistic minded health professionals under one roof is beyond convenient; it allows for assessments and a comprehensive wellness plan for a client who may be experiencing complicated symptoms triggered by anxiety, allergies, burnout, sports injury, or for someone who wants to strengthen their immune system or overcome a struggle with weight, smoking, insomnia, phobias, substance abuse or addiction. Services and classes at Essex Wellness Center’s waterside locations on nearby Novelty Lane include Tai Chi and Qigong with Master Teacher David Chandler, Pilates, yoga, mindfulness meditation, Reiki, Barre, Zumba and personal and private fitness training.Essex Wellness Center founder and director Heidi Kunzli, MS, LADC, created this consortium of highly experienced holistic providers following the same high standards by which she grew her internationally acclaimed Privé-Swiss mental health retreat program in Laguna Beach, California. Founded 14 years ago, Privé-Swiss maintains a world-renowned reputation for offering clinical excellence through practitioners who deliver exceptional quality in care. Program updates, class schedules, new services and news about health and wellness will be posted through facebook.com/ essexwellnesscenter , on Twitter @essexwellnessct and at www.essexwellnessctr.com. Call 860.767.7770 with questions or to make an appointment. Now in its fifth year, the goPINK Project is an annual event held during the month of October, in honor of Breast Cancer Awareness Month, in which hair salons, businesses and schools come together throughout Middlesex County to raise funds for the Middlesex Hospital Cancer Center. Donations cover the costs of integrative medicine therapy for patients, a complement to conventional treatment that focuses on the whole person – mind, body and spirit. Patients choose from yoga, Reiki, massage, reflexology, meditation and more. Middlesex Hospital’s Cancer Center and its Nationally Accredited Comprehensive Breast Center provide the latest technology, treatment and clinical trials for a wide variety of cancers, with the personal touch of a nurse navigator. Georgi Marino and Ellie Gagnon, owners of EG Salon in Middletown, established this annual fundraiser in 2010. Since that time, the event has raised $68,393 to support breast cancer patients at Middlesex Hospital. During the event, individuals receive pink hair extensions and purchase t-shirts for $20 each from area hair salons and can make purchases at local businesses to support the cause. A Style Above Salon – offering pink hair extensions the entire month of October. Dyed pink streaks are also available, as well as t-shirts to purchase. Klippers Beauty Supply Depot – goPINK donation box at this location. Bella Capelli – offering pink hair extensions the entire month of October and t-shirts. ESSENCE for Beauty & Wellness – October 23, 5 to 8 p.m., donating 10% of Gio Minerals sales. T-shirts also available for sale. I first met Lilith (a legendary character from post biblical literature) while doing some supplemental reading for a theology course. In the article “The coming of Lilith: Toward a Feminist Theology” authored by Judith Plaskow, Lilith is described as a “demon of the night” who according to rabbinic legend was Old Testament Adam’s first wife. That night, after reading the article, I had what Carl Jung termed a Doppelganger dream (two representatives of the dreamer appearing in the same dream). In the dream, Ali A and Ali B were two little girls of about four years old. A was dressed in a pale pink, stiffly starched pinafore. B was dressed in torn jeans and on her feet she was wearing sneakers with big holes. She looked untidy-even dirty. The two girls were sitting at an outside table playing scrabble. In the dream, A was busy assembling words such as good, quiet, polite and kind. Each time A finished a word, B would reach out and scatter the letters to the ground. Frustrated, A reached over and shoved B off her chair. B fell down, but dragged herself up and swept all the letters off of the table. A then calmly entered a big white house and returned with a gun. She filled B with several rounds of bullets, stamped on the body until it was flat. Then, she folded the body into a square package and tossed it into a gutter. When I awakened from the dream, I had no idea what the dream was telling me and made no connection of the dream to the Lilith article. It was several weeks later while listening to Dolores Williams, an Africa American Womanist theologian, speak about her “search for Hagar” (Old Testament Sarah’s Egyptian slave maid) and how this text became a powerful paradigm for Womanists that I began making connections between the article about Lilith and my dream. I suspected that the legend of Lilith was a powerful paradigm for me. What were her characteristics that made it impossible for her to remain in Adam’s garden and why did I toss her in the gutter? I told my sister who was a Jungian Analyst about the dream and she gave me an article published in The Quadrant-a journal of the C.G. Jung Foundation. The article was written by another Jungian analyst-Barbara koltov. The title of the article was simply-Lilith. I only read to page three; my eyes were riveted to the description of Lilith: “It is said that Lilith has the form of a beautiful woman from the head to the navel, and from the navel down she is flaming fire.” I had painted that picture many, many years before while attending a convent boarding school. It was Lilith. I would guess that the nuns tossed my painting as I never saw it again. Reading further, I learned that the legend of Lilith, found in Arabic, Assyrian, Babylonian, Canaanite, Hebrew, Persian, Sumerian and Teutonic mythology abounds with her characteristics. She is the embodiment of rebelliousness and assertiveness. Lilith is instinctual, earthy, prophetic, intuitive, fiery, dark, a seductress, desolate and full of rage. She is powerful. In the article, Koltov reminds her readers that the traditional patriarchal mode of dealing with such a counter-force that derives her energy from opposition has been to suppress-or cast her out. As my dream suggests, I took that part of my feminine nature, that part of me that wants to make trouble and cause chaos, and threw it in the gutter-out of Adam’s garden. Is it any wonder? After all, there is ever in the consciousness of a small child the need to feel safe and consequently the tendency to deny or split-off what appears to be unacceptable. I am certain that as a child of a patriarchal culture, I learned early on that the characteristics of Lilith were unacceptable. However, sometimes our psyche urges us through dreams, meaningful coincidence and illness to exteriorate what lies within. Several months after my encounter with Lilith, my body, through illness, presented me with another image that punctuated the repression of my rebellious and assertive characteristics. I learned that I had a melanoma near my right jaw. While under local anesthesia, I can remember that as I lay on the table and the surgeon made his incision, I had an image in my mind’s eye of my jaw as a channel lock-locked in a position of about one-third open. As the surgeon continued working, although I could not feel anything, it “felt” as if a pin had been removed from my jaw and I would finally be able to open my mouth fully. It was at that moment that I knew that Lilith’s energy that had been walled off for so long was finally going to be available to me. I had been holding dear to false security for too long. Thanks to many meaningful coincidences, I welcomed that part of me, the part that I tossed into the gutter, back home. It is still a struggle. But when I feel that energy-mostly my fiery anger with cruelty to animals (e.g., the hideous and unnecessary drowning of “pesky” beavers in Essex), the cynical and scandalous disregard of our military, the politically inspired obtrusion, aimed at low information voters, that there is a “war on women” and dopey academic elites who indoctrinate our children and grandchildren with the “joy” of Socialism and the ruse of human-caused climate change (aka, Global warming), I am no longer polite or taciturn. To ignore those feelings would simply be an out-picturing of a once deeply embedded false belief that my full feminine nature is not worthy of my deepest respect. These are a few of my hot-blood issues. I suspect that there are legions of women, particularly from the over-fifty crowd, who experience this brand of self-repression; the anger wells-up, the blood begins to boil, but the fire in the belly is quickly extinguished for fear of being labeled “bossy,” bitchy or aggressive. I say self-repression as it seems unproductive to keep chiseling and growling about our American men who made the mistake of also being born into a patriarchal culture. Oppressing them as we feel or felt oppressed is not the answer. Old School feminists, who achieved much for American women, made the mistake of projecting their dissatisfaction outward onto our guys and launched a war on the men in this country. For the past forty plus years, there has been a concerted effort to demonize, infantilize, feminize and over-medicate American men and boys. It appears to me that as long as we project dissatisfaction outward onto the men in our society, we are using a neurotic means of attempting to overcome the uneasiness of self-repression. Yes, we were born into a patriarchal culture as were our men, but the path to wholeness is to pay attention to our own unique inner-drama by listening to what our psyche is trying to communicate to us through dreams, meaningful coincidences, illness and that fire in the belly. ESSEX— The board of selectmen Wednesday reviewed a conceptual plan for state grant-funded improvements to Main Street in the Ivoryton section that could be put out to bid in the spring of 2015. The town last year was awarded a $435,000 state Main Street Investment Fund grant for several improvements that would slow traffic through Ivoryton village and create an improved pedestrian environment with four new or improved raised crosswalks. Based on a recommendation from an advisory committee chaired by Selectwoman Stacia Libby, the town earlier this year hired Anchor Engineering Services of Glastonbury to prepare preliminary plans for the project. One key component of the plan is the removal of a raised island at the intersection of Summit Street and Main Street that was constructed in the early 1970s with little input from the public. The removal would create a wider T intersection for the two streets. The plan also calls for new curbing and sidewalk, along with the new crosswalks. There would also be several new lantern pole-style streetlights installed on the easternmost end of Main Street, extending lighting that was first installed with state grant funding in 2005. A reconfiguration of the parking area for the Ivorvton Park on the north side of Main Street would add a handful of additional public parking spaces for the village. Libby said some of the improvements depicted in the plan would require approval from owners of private property on the street. Libby said the conceptual plan is now being reviewed by several town commissions, with a goal of putting the project out to bid by May 2015. 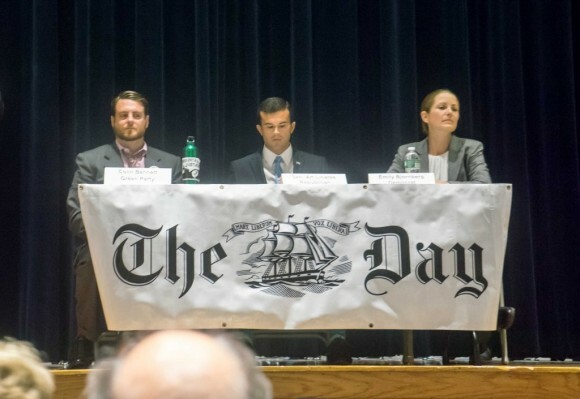 OLD LYME— A legislative appointment to a state task force on children’s jewelry was the focus of the sharpest exchange Tuesday as three candidates for the 12-town 33rd State Senate District seat faced off in the first campaign debate. Republican State senator Art Linares of Westbrook, Democratic challenger Emily Bjornberg of Lyme, and Green Party nominee Colin Bennett of Westbrook appeared before a crowd of nearly 100 voters at the Lyme-Old Lyme Middle School for an hour-long session that was co-sponsored by the New London Day and the League of Women voters. Day editor Paul Chionere posed written questions, most submitted from audience members, to the candidates. Linares, a 25 year-old incumbent seeking a second term, and Bjornberg, a mother of two who works in the Youth and Family Ministry of Deep River Congregational Church, agreed on some issues, such as support for small businesses, and differed on others, such as the stricter state gun law enacted last year. Linares had voted against the gun bill, contending it was never fully presented at a public hearing and imposed “unnecessary” restrictions on “law abiding citizens.” Bjornberg, noting she is from a “family of hunters”, said she would have supported the legislation, and contended Linares was not engaged during the crafting and debate on the bill. But it was a question on the environment that prompted the sharpest exchange of the session, with Bjornberg contending a Linares appointment to a 16-member state task force reviewing the safety of children’s jewelry, particularly the presence of cadmium in the jewelry, showed a lack of concern for the environment and children’s safety. As the ranking Republican member of the Children’s Committee, Linares was appointed to the task force, or allowed to designate a member in his place. Linares named Brent Cleaveland, the executive director of the Fashion Jewelry and Accessories Trade Association of Rhode Island. Bjornberg said Cleaveland is a paid lobbyist for the children’s jewelry business, and has publicly opposed limits on the mineral cadmium in jewelry. She noted that cadmium has been listed as a potential human carcinogen by the U.S. Environmental Protection Administration, and also claimed that Cleaveland has publicly downplayed the hazards of lead. Bjornberg raised this issue during the exchange on the environment, and again in the final minutes of the debate. Linares said Cleaveland is “an advocate for making children’s jewelry safe.” Linares also contended a bill that Bjornberg had expressed support for, to ban all pesticides from high school athletic fields, would have imposed a costly new mandate on schools districts in the 33rd District. Bennett, a substitute teacher who has run for the seat previously on the Green Party line, avoided direct criticism of the two major party candidates. Bennett said he was uncertain whether he would have supported the 2013 gun law, but expressed opposition to plans to expand natural gas service in Connecticut because much of the gas is produced through hydraulic fracking. Bennett also called for expanded investments in clean energy technology and legalization of the recreational use of marijuana as economic development measures for the state. Bennett will also participate in a second debate scheduled for Tuesday Sept. 23 at 7 p.m. at Valley Regional High School in Deep River. Another debate sponsored by the Westbrook Council of Beaches is scheduled for Oct. 6 at the Mulvey Municipal Building in Westbrook. The 33rd District includes the towns of Chester, Clinton, Colchester, Deep River, East Haddam, East Hampton, Essex, Haddam, Lyme, Portland, Westbrook and sections of Old Saybrook. REGION 4— A summary judgment from Middlesex Superior Court Judge Julia Aurigemma has ended a lawsuit filed against the school district by former Valley Regional High School Principal Eric Rice, though an appeal of the decision to the Connecticut Appellate Court remains a possibility. In a decision issued on August 15, Judge Aurigemma rejected claims by Rice that the school district violated terms of his October 2010 release and resignation agreement when it released emails and other information on his brief tenure as the high school principal in response to a freedom of information request from the Hartford Courant. The newspaper published an article on Rice’s departure from the principal position in June 2011 that included information from the emails. Rice, represented by the Hamden law firm Gesmonde, Petrosimone & Srigrinari, filed a lawsuit in December 2011 contending the release of the information violated the terms of the agreement and defamed him. The legal action was also filed against Superintendent of Schools Ruth Levy and former assistant superintendent Ian Neviaser as individuals. After months of proceedings and motions before four different judges, and depositions from Levy and Neviaser, Aurigemma agreed last spring to hear arguments and issue a summary judgement on the case, which was initially listed for a trial at the Middletown courthouse in November. In the decision, Aurigemma determined the release and resignation agreement between Rice and the school district that was signed before his departure from the high school principal job in October 2010 was “comprehensive,” and under its terms Rice waived any further legal claims against the school district. Under the agreement, Rice, who assumed the principal job in August 2010 and was later a subject of complaints from teachers and other staff, received $62,000 in severance pay and health insurance coverage until he found other employment. The agreement also included a letter of recommendation which was negotiated by attorneys for Rice and the school district. Rice, a Chester resident, later assumed a teaching position with the West Haven school system. The judge’s decision also rejected claims that the school district had defamed Rice by releasing the emails and other documents in response to the freedom of information request. Aurigemma determined that all of the documents were from the time period covered by the release and resignation agreement, and that school officials had been “deliberative” in deciding which documents to release to the newspaper. The judge determined that Rice had not been defamed by the school district, or by Levy and Neviaser. Attorneys for Rice earlier this month filed a motion to appeal Aurigemma’s decision to the Connecticut Appellate Court. A status hearing ion the case is scheduled for Oct. 9 at Middlesex Superior Court. ESSEX – Gregory R. Shook, President & CEO of Essex Savings Bank announced the completion of distribution from the Directors’ portion of the Community Investment Fund amounting to $44,000. Amounts range from $10,000 to $500. Total distributions for the year will amount to $223,373 and $3.9 million since the 1996 inception of distributing 10% of after tax net income. Donations for this portion have been allocated to the following non-profit organizations. Camp Hazen YMCA * The Chester Historical Society, Inc. * Child & Family Agency of Southeastern Connecticut, Inc. * Community Foundation of Middlesex County * Connecticut River Museum at Steamboat Dock * The Deep River Historical Society * Essex Historical Society * Essex Land Trust * Essex Winter Series * Florence Griswold Museum * The Ivoryton Library Association * Katharine Hepburn Cultural Arts Center & Theatre * Lawrence & Memorial Hospital * Lyme Academy College of Fine Arts * Lyme Art Association * Lyme Land Conservation Trust, Inc. * Lyme Public Library, Inc. * Lymes’ Youth Service Bureau * MacCurdy Salisbury Educational Foundation, Inc. * Madison Community Services, Inc. * Madison Land Conservation Trust * Middlesex Hospital * Musical Masterworks * The Old Lyme-Phoebe Griffin Noyes Library Association, Inc. * Rotary Club of Essex Foundation * Tri-Town Youth Service Bureau, Inc. * Valley Shore YMCA * Vista (Vocational Independent Supported Transitional Alternative). Let the dancing begin! In September young dance students from our shoreline communities will soon be putting on ballet slippers for classes at The Katharine Hepburn Cultural Arts Center. Eastern Connecticut Ballet is proud to offer its Young Children’s Program for ages 3-7 in this landmark theater. 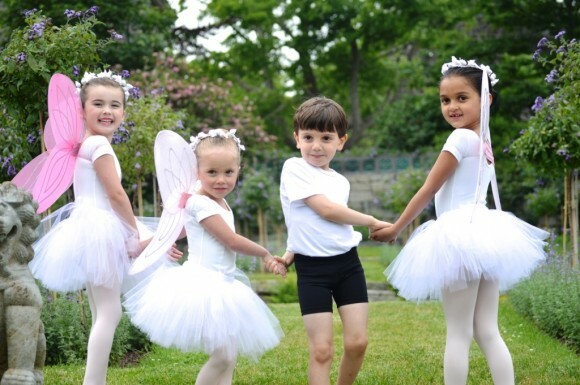 Known for encouraging creativity and fun, the program was voted The Shoreline’s Best Children’s Ballet School by Connecticut magazine. With expert instruction, girls and boys learn basic ballet skills, coordination, and a love of music. The classes provide an excellent foundation for the future study of classical ballet. Founded in East Lyme in 1992, Eastern Connecticut Ballet is one of the state’s premiere schools for dance with an enrollment of more than 300 students from age two to college-age. From their first steps in the studio to performing onstage, ECB dancers discover the joys of this vibrant art form. Space is available in classes on the East Lyme main campus as well. Visit easternctballet.com for information and registration forms or call ECB at 860-739-7899. DEEP RIVER— The board of selectmen this week approved contracts with three local firms for development on a town-owned parcel at the Plattwood Park Industrial Area. The board endorsed the contracts at a meeting Tuesday after selecting the three firms earlier this summer following a request for proposals. First Selectman Richard Smith said the three firms, Top Notch Electrical Services LLC, Winthrop Tool LLC, and Moyers Landscaping Services LLC, will be required to begin construction of an industrial building on their assigned parcel by April 2015. The industrial building lots are being divided from a four-acre parcel on the northwest corner of the town industrial area that the town purchased last year for $270,000 from local resident Gary Mislick. The plans, which have received approval from town land use commissions, call for three lots fronting on a new road that would end in a cul-de-sac. The agreement calls for the town to construct the access road for the parcels. Under the contracts, the three businesses would be required to pay municipal property tax on the property, including tax on all buildings and equipment. Under the terms of a 40-year lease, the businesses would pay a nominal rent on the land of only $1 per year for the first ten years, with annual rent increasing to $3,600 per year in October 2024. The lease also includes an option to buy the parcels, with the annual rent on the parcels rising every ten years through 2054. In a separate development Smith reported that a large manufacturing company that had expressed interest in a 59-acre industrial parcel on the east side of Route 154 has now stepped back from a possible purchase of the land from the Mislick family. Smith had announced a possible sale of the parcel, which was rezoned industrial in 2006, at the Aug. 12 board of selectmen meeting. Smith said the costs of constructing an access road in to the parcel, which would have to extend more than 1,000 feet after a crossing of the Valley Railroad tracks, were too much for the unidentified prospective buyer. Smith said the land remains on the market for sale and development. AREAWIDE— Republic State Senators Art Linares and Democratic challenger Emily Bjornberg have agreed to at least three public debates for their election contest in the 12-town 33rd Senate district, though Bjornberg is calling for at least one more face-off to be held in one of the northern towns of the district. In a separate campaign development, Colin Bennett of Westbrook has been endorsed the receive the Green Party line on the Nov. 4 ballot. Bennett has run for the seat several times as the Green Party nominee in past elections where former Democratic State Sen. Eileen Daily of Westbrook faced Republican challengers. The Green Party has secured a ballot line in the district with past campaigns by Bennett, and particularly with the 2012 contest after Daily’s retirement where Melissa Schlag of Haddam won nearly ten percent of the vote as the Green Party candidate in the contest with Linares and Democratic nominee Jim Crawford of Westbrook. Schlag was elected last year as the Democratic first selectwoman of Haddam, and is supporting Bjornberg in this year’s election. Bennett is not believed to be waging an active campaign for the Nov. 4 vote, but he has been included in at least one of the Linares-Bjornberg debates. Bennett has been invited to participate in a Sept. 23 debate at Valley Regional High School in Deep River that is sponsored by the Essex Library. The debate begins at 7 p.m. in the school auditorium, with written questions from the audience that will be screened by the debate moderator, Essex Librarian Richard Conroy. The first campaign face off between the one-term Republican incumbent and Bjornberg, of Lyme, will be held Tuesday Sept. 16 at the Lyme-Old Lyme Middle School in Old Lyme. The session, sponsored by the New London Day, begins at 8 p.m.
Old Lyme is part of the 20th Senate District, but Lyme, its northern neighbor, is in the 33rd District. The district also includes the towns of Chester, Clinton, Colchester, Deep River, East Haddam, East Hampton, Essex, Haddam, Portland, Westbrook, and parts of Old Saybrook. The candidates will also appear at a debate sponsored by the Westbrook Council of Beaches in early October, and at a forum, not a debate, sponsored by the Chester-Deep River-Essex chapter of the Middlesex Chamber of Commerce on the morning of Oct. 3 at the Chester Meeting House. Bjornberg this week urged Linares to agree to hold one additional public debate in one of the five northern towns of the district, Colchester, East Haddam, East Hampton, Haddam, or Portland. Bjornberg said she would keep her schedule open for a northern town debate. ESSEX— A crowd of more than 70 residents was on hand late Wednesday afternoon as the board of selectmen held a dedication ceremony and ribbon cutting for the Town Hall Civic Campus project. 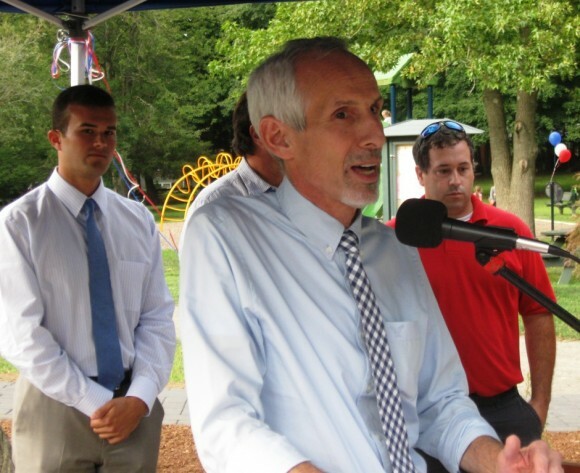 The project, which includes a an expanded and improved parking area for town hall, new tennis courts, and a new handicapped accessible children’s playscape, was funded through a combination of state grand funds with some town funding. Completion of the tennis courts earlier this year marked the final phase for a project hat began last fall with work on the town hall parking lot. Most of the heaviest construction work was done by Xenelis Construction Inc. of Middlefield, with some work completed by town public works employees and sub-contractors. The town was awarded a $471,500 Small Town Economic Assistance Program, (STEAP) grant for the project in the fall of 2012. Town Finance Director Kelly Sterner said this week the total cost of the project was about $620,000, with the largest components covered by the grant funding, Town funds were used for improvements to the front entrance to town hall on West Avenue, and new crosswalks and sidewalks on Grove Street at the other side of the building. A $10,000 donation from the Bauman Family Foundation paid for lighting for the tennis courts. 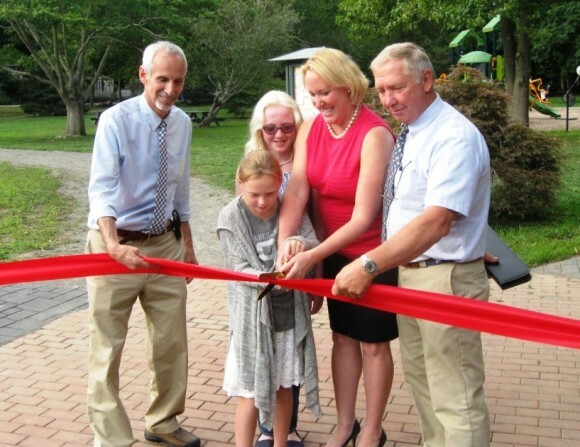 Sterner was one of several town employees praised for their efforts on the project by First Selectman Norman Needleman at the ceremony Wednesday. Needleman, who described the project as a “perfect example of state and local partnership,” said Sterner had helped prepare the grant application while also guiding the different sources of funding for the project. He also praised Parks and Recreation Director Rick Audett for his efforts during construction of the tennis courts and playscape at the Grove Street Park that abuts the town hall property. Also participating at the ceremony Wednesday were two incumbent legislators from different political parties who are seeking new terms in the Nov. 4 election, 36th District Democratic State Rep. Phil Miller of Essex, and 33rd District Republican State Senator Art Linares of Westbrook. 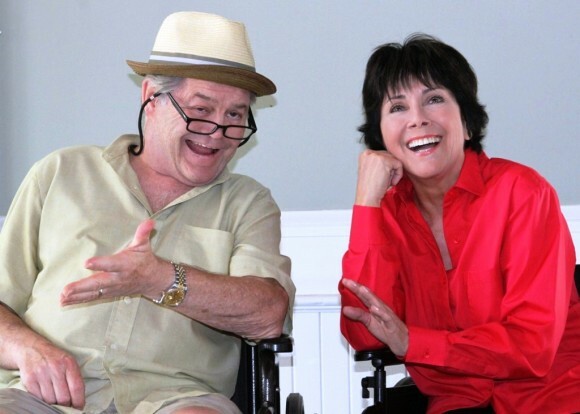 Micky Dolenz* and Joyce DeWitt* (photo courtesy of Anne Hudson). IVORYTON – The world premiere of a brand new play by acclaimed writer of The Simpsons, Mike Reiss, will take place at the historic Ivoryton Playhouse in Ivoryton, CT. Previews begin September 24th – the play opens on September 26th and runs through October 12th. Micky Dolenz (of The Monkees) will star alongside Joyce Dewitt, veteran actress and star of the ABC television hit series Three’s Company. Dolenz has delighted audiences with his performances on stage in the Elton John/Tim Rice production of Aida;Grease; Pippin’; A Funny Thing Happened On The Way To The Forum; and, most recently Hairspray in the West End playing Wilbur Turnblad. Reiss, who is writer and producer for the long running TV show, The Simpsons, also created the animated series The Critic; the webtoon Queer Duck and worked on the screenplays for Ice Age: Dawn of the Dinosaurs; Horton Hears a Who! ; The Simpsons: The Movies; and, My Life In Ruins. Ivoryton audiences turned out in droves in the June 2013 for his hilarious play, I’m Connecticut, which was a huge popular and critical success. Generously sponsored by Hamilton Connections and Middle Oak. 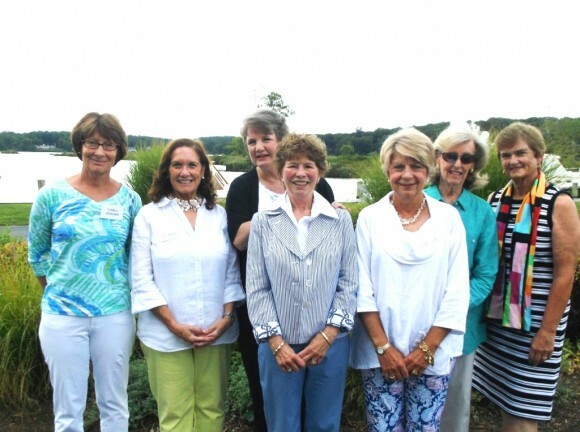 Essex Garden Club has announced its new officers. Officers for the for 2014-15 are Linda Newberg, president; Barbara Burgess, first vice president; Dianne Sexton, second vice president; Barbara Hall, recording secretary, Barbara Marden, corresponding secretary; Patricia Mather, treasurer; and Carol Denham, assistant treasurer. In her opening remarks at the September meeting, Newberg described the club’s agenda and activities for the coming year, and introduced the theme for this year, “A Tribute to You”. She went on to say that the success of the club’s projects is directly dependent on the tireless work of the many club volunteers. These projects include civic beautification, scholarships, and educational and conservation initiatives. The Town of Essex’s Transfer Station and Recycling Center, which is located a 5 Dump Road in Essex, will adopt new use procedures, effective October 1, 2014. From that date forward, users of the transfer station must either have: 1) a valid official sticker affixed to the windshield of their vehicle, or 2) a pre-paid punch card in hand, before disposing of household garbage and trash at the Essex town transfer station. Use of the transfer station is limited, exclusively, to the residents of Essex, Centerbrook and Ivoryton. The transfer station is located in Essex at 5 Dump Road off Route 154. It is also just off Exit 4 of Route 9. The hours of operation at the facility are Monday, Thursday, Friday, and Saturday from 7:00 a.m. to 3:00 p.m.
Windshield stickers permitting a year’s unlimited access to the transfer station can only be purchased at the Town Clerk’s office at the Town Hall in downtown Essex. The cost of a one year permit is $125, and $75 for seniors. They can be paid for by cash or check, but not by credit card. The Town Clerk will also sell 10 bag punch cards for $25 a card. In the addition, the transfer station at 5 Dump Road will sell 10 bag punch cards. which can be paid for by check, credit or debit card, but not by cash. Effective October 1, there will also be additional Supplemental Disposal Fees for users of the transfer station. The supplemental fees, which will be collected at the transfer station, will range in price from $5 for the disposal of an old tire, to $20 for the disposal of sleeping furniture. However, there will be no extra Supplemental Disposal Fees for many items, such as antifreeze, computers, leaves or paint. Essex residents can download the Transfer Station’s Resident Pass Application form by going to the Essex town website at www.essexct,gov. The form on the website is listed under “News & Announcements.” Also available on the Town of Essex Transfer Station & Recycling Center website is a complete roster of Supplemental Waste Disposal fees, effective October 1. A benefit when purchasing an annual user sticker before October 1, 2014 is that purchasers can begin using the annual stickers immediately, thus giving them some days free of fees before the October 1, 2014, the effective date of the new windshield stickers and punch cards. 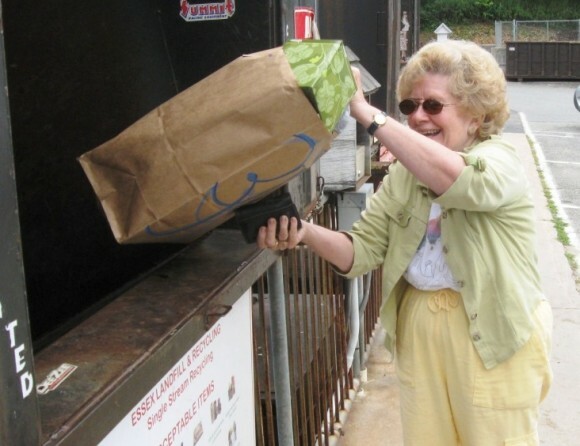 In announcing its new waste disposal rules Essex residents were reminded that the annual stickers and punch cards only allow the disposal of household garbage and trash. Information regarding other accepted disposal items can be found in the transfer station’s brochure, which is available at the transfer station, and on its website. 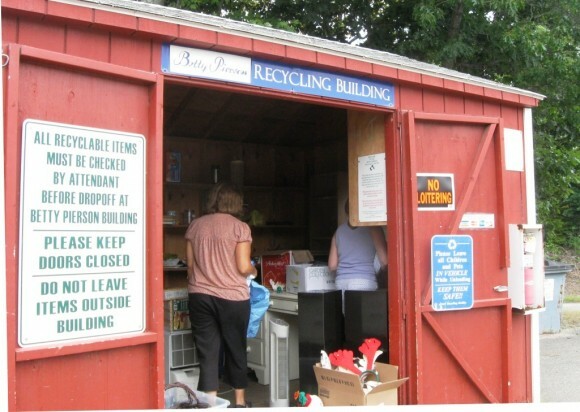 Another service at the Essex transfer station is a recycling center that offers reusable items that Essex residents are offering without charge to their neighbors. Items such as wooden furniture, household items and bicycles in good condition may be left for the use of fellow Essex residents at the center. The items are for personal use only. Essex residents who wish to pick up these items are restricted to one trip a week to the Betty Pierson Recycling shed. No loitering at the building is permitted, and the staff at the transfer station will enforce these policies. ESSEX— A lawsuit against the Essex Veterans Memorial Hall Inc. that was filed last December has been withdrawn after a Middlesex Superior Court judge held settlement conferences with the parties. The lawsuit filed by local lawyer Michael Peck included the town because the town remains a fall back owner of the Essex Veterans Memorial Hall property located in the Centerbrook section. Peck, a veteran and Chester resident, filed the lawsuit on behalf of Michael Bergeron, a town resident who is a Gulf War veteran. Peck claimed in the suit that Begeron had been improperly banned from the property, including a club area where alcoholic beverages are sold, and from local veterans activities. The lawsuit also claimed Essex Veterans Memorial Hall Inc. had lost, and never regained, its status as a non-profit tax exempt organization, and that a majority of the EVM club members are no longer U.S. military veterans. The town-owned property was donated to returning World War II veterans in 1946 for use as a meeting hall for local veterans organizations. The building has served as a meeting hall for the local Veterans of Foreign Wars post and occasionally other veterans organizations for more than 60 years. The separate club has been in operation during this time for sale of alcoholic beverages to members and their guests. Peck said this week he withdrew the lawsuit at the end of July after three settlement conferences directed by Middlesex Superior Court Judge Edward Domnarski, who is an Essex resident. Also participating in the sessions was Richard Palladino, an Old Saybrook lawyer retained by EVM Inc. in response to the lawsuit. Peck said town attorney David Royston declined to participate in the sessions. Peck said the settlement did not result in reinstatement of Bergeron as a club member, but did clarify the legal status of the property and various procedures that are required of EVM Inc.. as a tax exempt not-profit veterans organization. He said EVM Inc. has regained its 501C18 status as a tax exempt organization, and has also pledged to strive to ensure that at least 75 percent of club members are veterans. After a review by the state Liquor Control Commission, the EVM club retains its liquor license. The club is planning its annual Pig Roast, which is open to the public, for Saturday Sept. 13. ESSEX— The board of selectmen Wednesday received a long-awaited report on municipal capital building projects. The selectmen deferred discussion to a Sept. 17 meeting on a list of projects that could require more than $6 million in bonding if all of the projects were included in a bonding authorization resolution. The 22-page report was prepared by a Capital Projects Building Committee that was established the fall of 2013 to carry forward the efforts of a capital projects study committee that was formed in 2012. The committee was chaired by Selectman Bruce Glowac, with members that included Finance Director Kelly Sterner and Leigh Rankin, a former U.S. Coast Guard officer who also serves on the Region 4 Board of Education. The committee worked with the engineering firm CME Associates Inc. of Woodstock to develop preliminary cost estimates for each project. Glowac said the report lists projects in priority order, and includes projects the committee believes should be addressed by the town looking forward for the next ten years. The top priorities are replacement of the Walnut Street and Ivory Street bridges in the Ivoryton section, along with five improvements at Essex Elementary School, the most important being replacement of most of the school roof. Cost estimates for the bridge projects are $2.1 million for the Walnut Street bridge, and $450,000 for the Ivory Street bridge. The elementary school projects total $2.52 million, including $1.4 million for the roof replacement, $600,000 for air conditioning at the school, $225,000 for paving work around the front entrance, and $185,000 for improvements to the school media center, including removal of asbestos located under the floor tiles. The town has already expended $110,000 to convert the school to newly available natural gas heating. The report estimates the Walnut Street bridge replacement and the school roof replacement would be eligible for $2,055,000 in grant funding reimbursement that would reduce the actual expense for town taxpayers. The report lists six improvements at town hall with a total estimated cost of $1,165,000. Projects include roof replacement-$200,000, 47 new energy efficient windows-$115,000, reconfiguring land use offices-$500,000, air quality improvements-$200,000, bathroom improvements $120,000, and a new fire alarm system that would include a fire suppression system for the town records vault-$30,000. The report lists three improvements for the town public works garage with a total estimated cost of $470,000. The projects include replacing the roof of the garage that is more than 30 years old-$109,000, a new heating system for the facility-$97,000, and a new two bay garage with a covered storage area for road salt and sand-$264,000. The selectmen are expected to review the report with the board of finance later this month, and hold one or more public information sessions during the fall before final decisions are made on a bonding authorization resolution that would be presented to town voters for approval in a referendum. 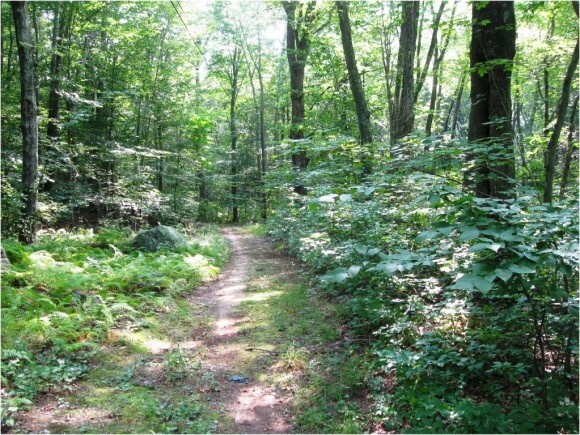 Visitors wishing to take a look at Essex’s 70-acre part of The Preserve can do so by driving down Route 153 from Essex towards Westbrook. Take a left off Route 153 on to Ingham Hill Road. Drive down Ingham Hill road until the road ends at a gated fence. To the left of the fence, and looking over the fence, are portions of the Essex part of The Preserve.